Kaun Banega Crorepati? Who wants to be a millionaire? Given a chance everyone wants to be crorepati in India. However, very few can actually become a crorepati. The reason could be a lack of financial literacy, lack of money, a lot of competition or fear of losing money. Almost everyone struggles throughout their life to become a crorepati, until and unless one becomes a big businessman, such dreams remains a dream for average middle-class people. However, a dream of a big car, home, and peaceful life can be accomplished by making an investment in multibagger stocks. Investment in multibagger stocks can surely make you crorepati in few years. Multibagger stocks give multifold returns to the investor. Even one multibagger stock in your portfolio can make you wealthy. You need to identify good multibagger and stay invested for few years. It is seen that many people generate extraordinary returns from the stock market. However for a small investor like you and me becoming crorepati from the stock market is still a dream. The reasons that stop us from becoming crorepati from the stock market are given below. We are not blessed with a skill to identify stock like rakesh jhunjhunwala or warren buffet. We make an investment based on the advice of friend, relatives or so-called stock market expert and suffer badly at a later stage. Our emotion controls our investment decision. Every time when the stock market goes up we run behind investing money in stock market. A few months later when the market crashed, we get panic and pull out our investments and book the losses. The above scenario is applicable to almost everyone. People enters into the stock market with the dream of becoming Crorepati but one or two downturns in stock market make them realized that they will not able to succeed in the stock market. They sell off everything and never come back to stock market again. So what is the solution? What small investor should do to become crorepati by investing in the stock market? What are the rules and strategies they should follow while investing in the stock market? Basic rules you should follow while investing in stock market. Invest only in fundamentally strong companies. Never invest in a stock based on a tip, do a research before investing. Never sell your stock when market is down but add more stock into your portfolio when market is down. Hold your stocks for the long term at least 5 years or above. Follow the basic rules given above and see the difference. 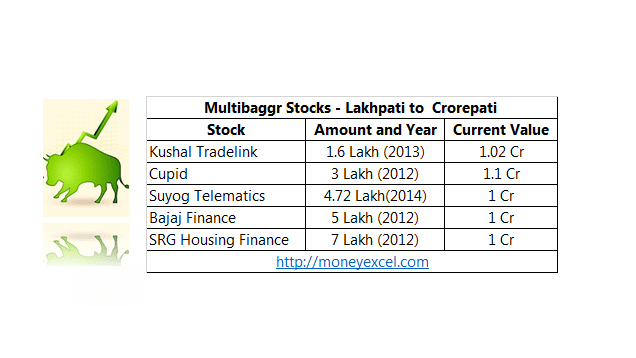 Let’s take a look at multi bagger stocks that have made investors crorepati from lakhpati in last 5 years. Kushal Tradelink is second multibagger stock. Kushal Tradelink is from a paper sector. Investment in Kushal Tradelink has made investor crorepati in just four years. Investment of 1.6 Lakh in Kushal Tradelink in 2013 is worth 1.02 Cr today. Cupid is another multibagger stock that made investor happy. Investment of 3 Lakh in Cupid has turned out to be 1.1 Cr in 5 years. Suyog Telematics one of the fastest growing company from telecom space. Investment of 4.72 Lakh Suyog Telematics in the year of 2014 has turned out to be 1 Cr in 3 years. Bajaj Finance is finance company. Bajaj Finance is constantly giving better performance. The investment of 5 Lakh in Bajaj Finance in the year 2012 has turned out to be 1 Cr in 5 years. SRG Housing Finance is a leader in Housing finance sector. SRG Housing finance performance is slightly poor compare to above stocks. Investment of 7 Lakh in SRG Housing finance in the year 2012 has turned out to be 1 Cr after 5 years. I don’t know that stocks mentioned above will give better return in future or not. However, stocks like Maruti Suzuki, Force Motors, TCI, HSIL will surely give better return in future. Unfortunately I missed the train as I have not invested money in any of the multibagger stocks mentioned above. Have you invested your money in stock mentioned above? What is your way of investing in the stock market? What strategy do you follow? Do you think that small investor can become crorepati from the stock market investment? nice article. I believe for next 5 years Shiva Cement, Meghmani Organics, Indosolar, Aries Agro and Mahindra Holiday & Resorts India can give very good returns. I will be keep investion on these stocks. I want to invest into shares of Aksh optifibre & Gitanjali Gems, how is the bet? Obviously It will be >5 Years investment project. Its good article & very true knowledge..Stock investment is all about long term gain..it is really difficult to identify those multibagger..will you suggest some stocks for let say 5 yrs of holding? I suggest TCI,HSIL, Gujarat Gas and GNFC for above 1 year investment.